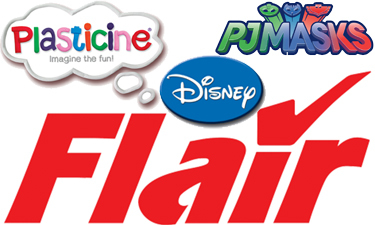 Flair Leisure Products Plc was established in 1999 by a team of industry experts and international toy companies and has achieved consistent growth over the last 12 years, making it within the U.K’s top 10 toy companies. Performance has been accelerated since Giochi Preziosi, an Italian firm with revenues in excess of 900mn Euros and that produces children’s TV series and toys based on them, acquired the Company. Flair are particularly well established in toys for boys and those catered to arts and crafts and therein add a positive contribution of new types of toys available within the wholesale portfolio at Baby Brands Direct. The brands available include PJ Masks, Plasticine, Cicciobello and Disney and include a host of toy product from figures to styling heads. The products are known for their uncompromising quality and recognised as having both longevity of use and fantastic play value. This company knows how to brand build with a strong team of leading toy business experts who each have proven success credentials to their name. The range added for trade access at Baby Brands Direct include their well-known PJ Masks licence toys that are suitable from 3yrs+. The high quality range of Plasticine and TV promoted lines add a creative lines for retailers to choose from. In addition to this, a selection of gorgeous styling heads in Disney and Barbie licences are available alongside baby Ciccibello. This doll is TV promoted and is made in the UK, it offers the opportunity of role play and interaction with its features including 20 phrases and sounds, giving kisses and going to sleep.